Inspired by our love for granola and our obsession with my new crunchiest ever granola: Chai Spiced Walnut Granola, it was actually my Dad who suggested I make bars or bites with the mix. He is a big granola fan and as soon as he said these clusters would be great as bars, I had to get into the kitchen and whip up a batch. When he said bars, I saw crunchy bites drizzled in homemade chocolate with a nutty sprinkle, and neither of us were disappointed. Based on the biggest clusters I have ever made, I used a date paste with peanut butter to hold the oat mix together which makes for such crunchy and satisfying bites. I used a mix of almonds, cashews and walnuts along with some teeny chia seeds for extra crunch, as well as stirring in some sultanas for a sticky and plump texture in every mouthful. I kept the flavouring simple with cinnamon, vanilla and a pinch of salt, allowing the texture to shine through. 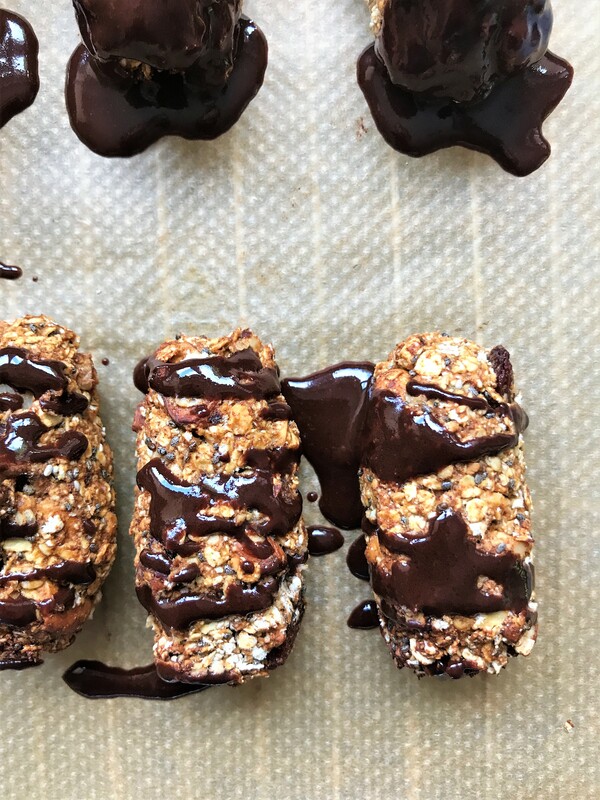 Plus there’s the homemade chocolate drizzle (or melt your favourite bar of chocolate) which makes these healthy bars more indulgent tasting – but still refined sugar free and super good for you thanks to the added powerhouse: chia seeds. Packed with fibrous oats, these little Chocolate, Chia and Mixed Nut Granola Bites make a great on-the-go snack or topping for smoothie bowls as they’ll keep you going. Or enjoy them as an evening bite with a cup of tea for a sweet treat that’s naturally sweetened. The range of nuts adds vitamins and minerals as well as healthy fats and the dates won’t spike your blood sugar levels, meaning you can have as many of these bits as you like! They’re addictive. 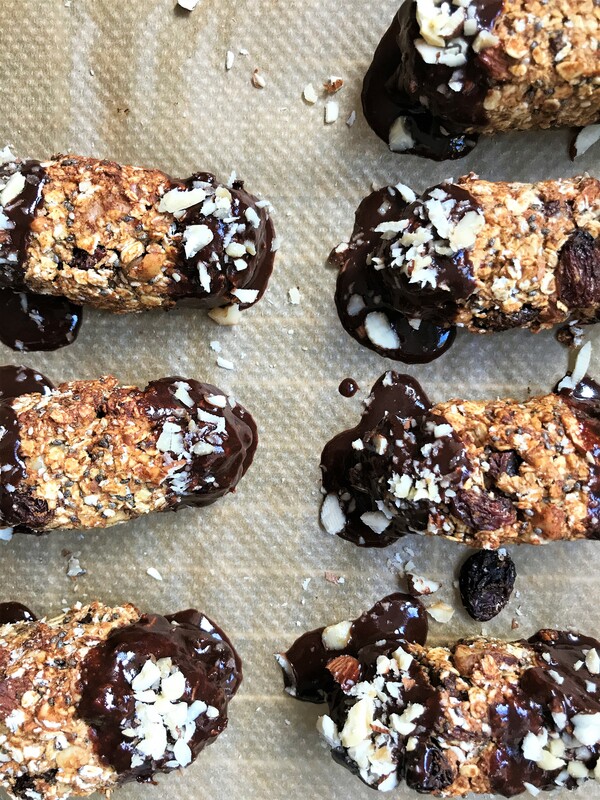 Crunchy granola bites covered in rich dark chocolate that make a delicious and healthy snack or breakfast. Preheat the oven to 160Fan/180*C and line a large baking tray with parchment paper. Soak the dates in boiling water for 10 minutes, drain and keep the water. To a large mixing bowl, stir together the oats, chopped mixed nuts, chia seeds, cinnamon, salt and raisins. In a food processor, blend the dates, peanut butter, vanilla and gradually add the reserved water until a smooth paste forms. You may need to scrape the sides down every so often. Add the paste to the dry mix and stir together well. Using your hands and a large tablespoon for measure, shape the mix into 14 bars making them quite compact. Line up on the baking tray and repeat until all the mix has been used. Bake in the oven for 20-25 minutes until crisp and golden. Remove from the oven and allow to cool fully on a wire rack before continuing. Make the chocolate drizzle by stirring the cacao powder and maple syrup into the coconut oil until smooth and glossy. Drizzle over the bars, sprinkle over the nuts if using, and allow to set in the fridge. Enjoy at room temperature, these bars will keep well in an airtight container for 5 days. Have you made my Chocolate, Chia and Mixed Nut Granola Bites? I would love to see your creations, so please tag me in your creations – I’m @nourishing.amy on Instagram and use the hashtag #nourishingamy or leave a comment below.